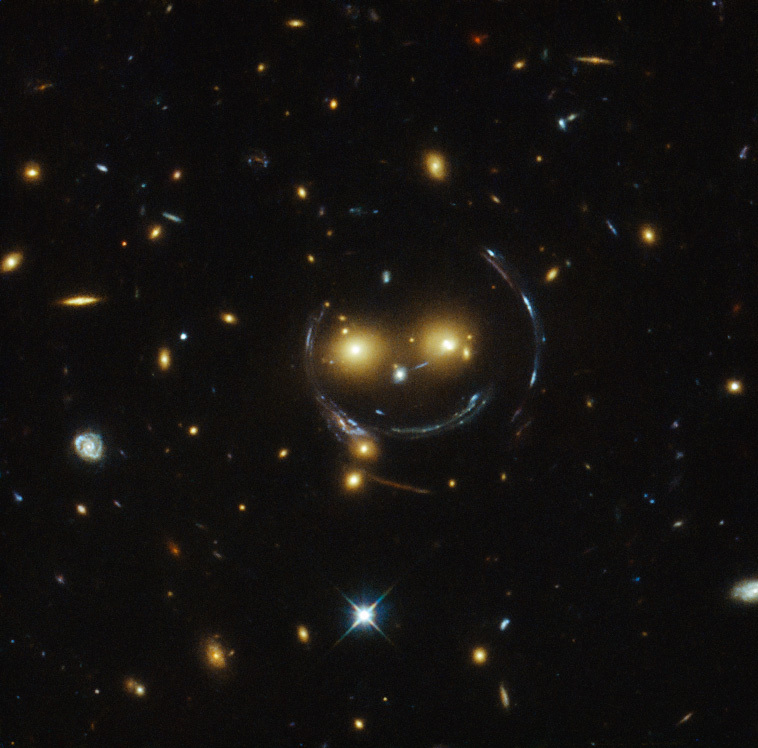 In the centre of this image, taken with the NASA/ESA Hubble Space Telescope, are two faint galaxies that seem to be smiling. You can make out two orange eyes and a white button nose. 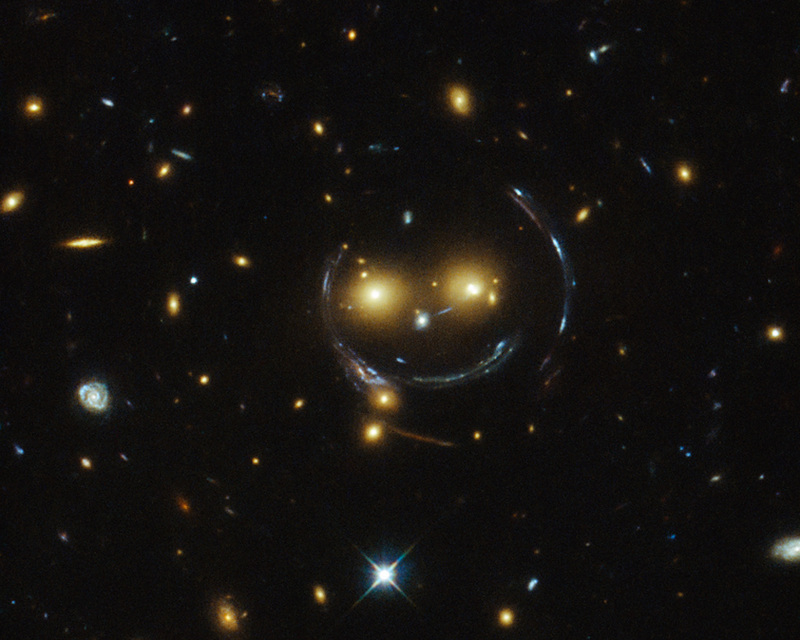 In the case of this “happy face”, the two eyes are the galaxies SDSSCGB 8842.3 and SDSSCGB 8842.4 and the misleading smile lines are actually arcs caused by an effect known as strong gravitational lensing. Massive structures in the Universe exert such a powerful gravitational pull that they can warp the spacetime around them and act as cosmic lenses which can magnify, distort and bend the light behind them. 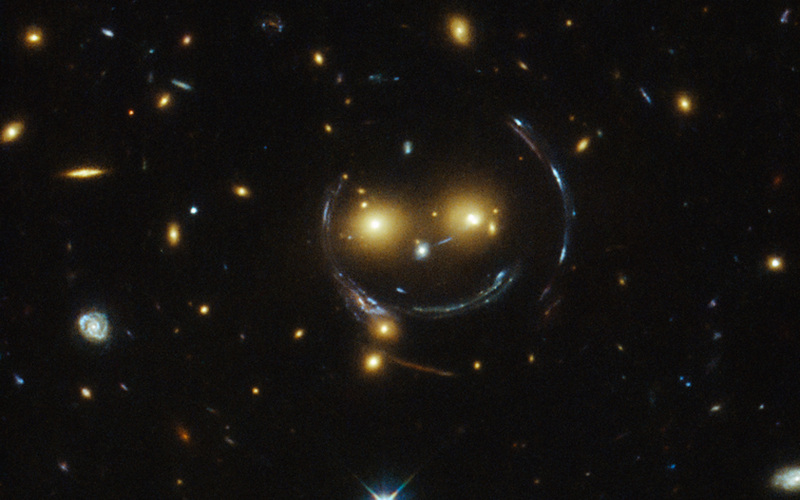 This phenomenon, crucial to many of Hubble’s discoveries, can be explained by Einstein’s theory of general relativity. 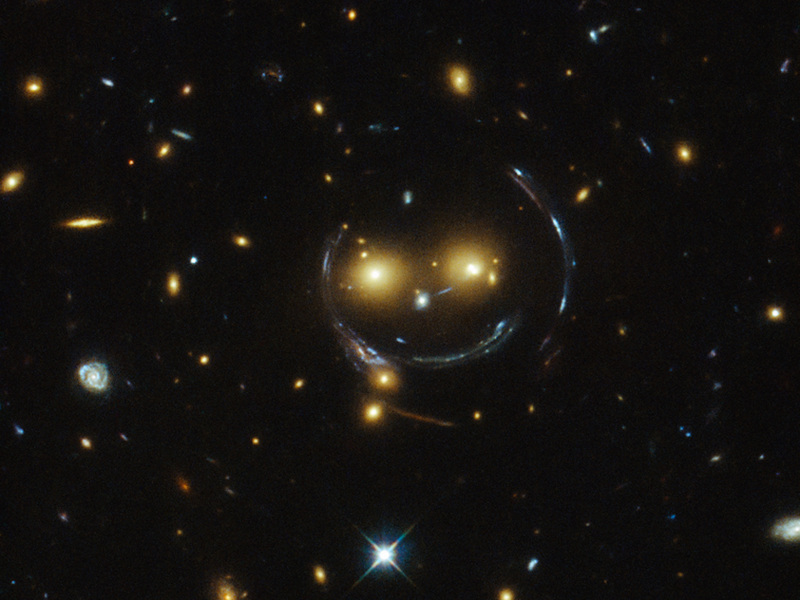 In this special case of gravitational lensing, a ring — known as an Einstein Ring — is produced from this bending of light, a consequence of the exact and symmetrical alignment of the source, lens and observer and resulting in the ring-like structure we see here. Hubble has provided astronomers with the tools to probe these massive galaxies and model their lensing effects, allowing us to peer further into the early Universe than ever before. This object was studied by Hubble’s Wide Field and Planetary Camera 2 (WFPC2) and Wide Field Camera 3 (WFC3) as part of a survey of strong lenses. A version of this image was entered into the Hubble’s Hidden Treasures image processing competition by contestant Judy Schmidt. Position (Dec): 48° 49' 18.19"